Towering at 2954 meters above sea level, Mount Apo is the highest mountain and volcano in the Philippines. It is located in Mindanao, a province which has been troubled by Muslim separatists in recent years. So would it really be worth going there? It's a long time since last update now. I have been traveling around Philippenes for the last few weeks and become a little bit addicted to this country. In all my stupidity I thought I could just fly into Kota Kinabalu and climb the mountain without bookings of any kind. But the limitation of accommodation on the mountain (mainly at Laban Rata), makes it necessary to book well in advance. And the park rules is pretty simple; no bed, no climbing permit will be issued. Most of Borneo is jungle and mountains, but there are some big and modern cities as well. I arrived one of them today, Kota Kinabalu, largest city in the province of Malaysian Borneo, and surprisingly modern. But why am I here? I was not very keen on returning to Cho Oyu this autumn, but Erik finally convinced me to give it one more try. While the weather kept me from summiting last year, a bad troath and chest-infection stopped me effectively at 7500 metres this year. But failing to summit is nothing compared to the fate of Guy. He never got down again. Erik and myself arrived Kathmandu a couple of days ago. Tomorrow we will leave to Tibet together with the other members on Cho Oyu 2008 expedition. You can follow the dispatches at Fieldtouring. When we crossed the border from Tajikistan to Kyrgyzstan, it was like coming to a different world. From the dry plateau of Tajikistan to a green lush valley below Pik Lenin (7134m) in Kyrgyzstan. But what happened to our original plan? A lot of unexpected things have happened during this Pamir expedition. First the Tajik police claimed that we had no permit to travel into the northside of Pik Karl Marx. So we had to travel all the way south into the Wakhan corridor on the border to Afganistan and Hindu Kush, to reach Pik Karl Marx from the southside. 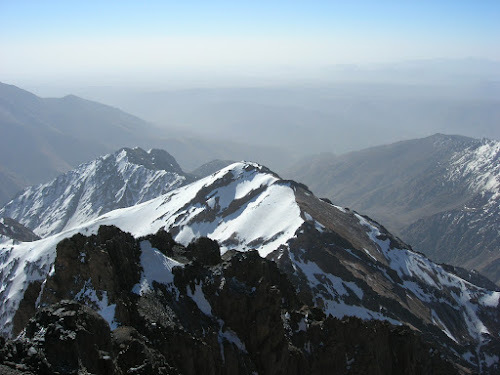 Pamir and Central Asia has been on my wish-list for a long time, and June 29 I'm going to Tajikistan and Kyrgyzstan together with two other people to climb two big peaks. Morocco is a wonderful destination, and I combined it with a hike in the Atlas Mountains and the highest summit Jebel Toubkal (4167m). This trip report is in Norwegian language only. Marrakech is the most interesting (and touristed) city of Morocco. An evening wandering around the lively square of Djemaa el-Fna is one of those once-in-a-lifetime experiences. A must for all backpackers. I enjoyed every minute in Marrakech before and after my hike in the Atlas mountains. This is Ensenada, said the busdriver, as he kindly tried to get me off the bus. At first glance it felt like I was in the middle of no-where. Only a couple of buildings, a long black beach and dense forest beyond. Villarrica (2840m) is a beautiful, cone-shaped, and very active volcano located at the northern end of Chile's Lakes District. The weather was perfect, but the dense sulphur smoke flowing down the normal route, could cause problems. 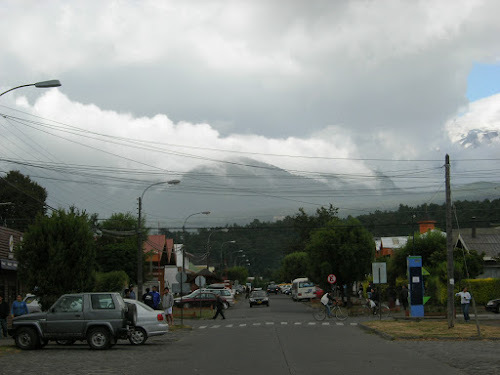 I was about to climb Volcan Villarrica (2840m) in Lake District of Chile today, but it was unfortunately hidden in clouds this morning, and even worse, it was raining heavily up there. My stomach has not been very reliable the last few days. In such circumstances it is best to stay a safe place, where toilet can be reached in very short time. But tomorrow (Feb 7) I have to move on for Lake District in Chile. After having attempted 4 different 6000-meter peaks in Andes and had great success on 3 of them, it was time to go to Valparaiso and Vina del Mar, simply to enjoy the beaches, food and nightlife. Pissis (6795m) is the third highest peak in South America and the world´s second highest volcano. This last obstacle to claim Andes Top 3 Peaks, turned out to be the finest and most adventureous of them all. Ojos del Salado (6893m) is the highest volcano on earth and also the highest point in Chile and second in South America. I went there together with the Norwegian 3 Summits Marathon team, shortly after the success on Aconcagua. Straight from a high altitude stay on Mercedario I hoped to reach the summit of Aconcagua (6962m) in just a few days, solo and unsupported. Well, success at last, things didn´t go as smooth as planned on the highest mountain in South-America. The 8th highest mountain in South-America (6700m) rarely sees any climbers. We were the 4th team this season, and none of the previous teams had summited. Would we be the first one? See the photos and find out ! !